The Electric Cooperative Government-in-Action Youth Tour has brought high school students to Washington, D.C. every June since the late 1950s. Students apply and are selected for this program by their local electric cooperative. Deep East Texas Electric Cooperative believes that students should see their nation’s capital up close, learn about the political process and interact with their elected officials. DETEC will send 2 students on the 2019 Youth Tour, scheduled for June 12-21, 2019. The featured speakers during Youth Day provide insight to the important roles electric cooperatives play in their community. Students gain a personal understanding of American history and their role as a citizen by meeting their Representative and Senators. Nearly 50,000 students from rural areas and small towns across America have participated in this program. Some of our Youth Tour alumni have gone on to design airplanes, to lead companies and to serve in the highest ranks of our government, including the U.S. Senate. 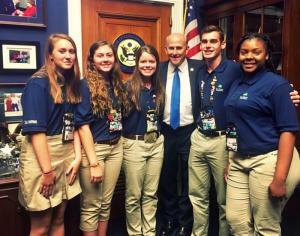 Don’t be surprised if you run into a former Youth Tour participant who is a congressional aide on Capitol Hill! Each year Deep East Texas Electric Cooperative sponsors 2 students who are attending a high school in the DETEC service area to the Government-in-Action Youth Tour. Participants must be either a sophomore or junior and are selected on the basis of overall excellence and involvement in extracurricular activities including leadership positions, academic awards, etc. Download the 2019 Application here. Applications due February 15, 2019.